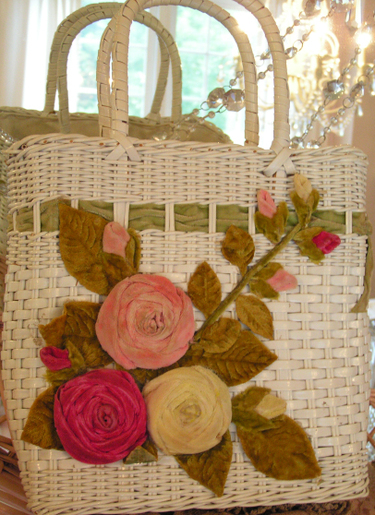 I recently lucked out and found three more of my favorite velvet embellished basket purses. They are so hard to find, so naturally I was thrilled with my serendipity! Here's a close shot of the velvet strawberries on the basket below. 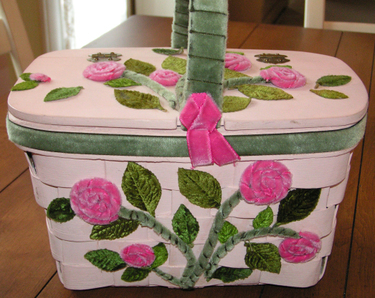 It's actually a sewing basket and the lid comes off entirely. 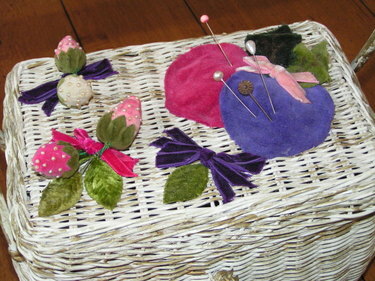 See how the purple and pink apples are actually pin cushions? I've already filled it with vintage packets of seam binding and ribbon. This one (below) I will use as a purse on date nights with George (the rare times that I don't need a huge tote bag). I L-O-V-E these colors. And this last one I won't actually carry, but I plan to use it for storage. Perhaps old sewing notions or my collection of old button cards? Not sure yet. So, that's it for today girls. Hope you enjoyed the velvety inspiration! I've got to run and get some more things made for the shop. 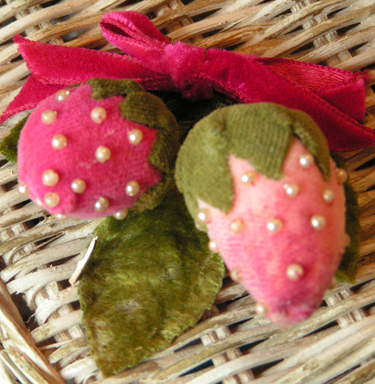 Tomorrow I will post little glimpses of Trinkets & Treasures that you will find in the shop......coming very soon! Absolutely gorgeous!!! You are so lucky to find these treasures:) Thanks so much for sharing such luscious pictures of them. Can't wait for the shop!!!!!!!!!! What a find! I absolutely love your new date night purse! It could dress up even the shabbiest pair of jeans! So pretty! I'm very happy that you were able to find three more of something you love to collect (it's such a great feeling when that happens). I love the baskets - they are so cute!! Andrea, these are beautiful!!! I love the velvet strawberries. Hello, Andrea! You will NOT believe what you have inspired me to do! After months and months of getitng so much inspiration from your blog, I decided to start my own! I can't believe it, since I am NOT a tech person AT ALL, and of course it is nowhere near as lovely as yours. It's called Joy for the Journey and is found at joyforthee.blogspot.com. Thank you sooo much for all the inspiration you have given me- and so many others! I anxiously await the shop! I love the colors on the "date night purse"!!!! Where and how did you find these? Lucky! Oh, I love the colors on the one you are going to carry. May have to start collecting some myself!! What's the point of working your fingers to the bone if you hand over what you worked for to someone who never lifted a finger for it? Hi there to every body, it's my first go to see of this weblog; this website carries amazing and genuinely good material designed for readers. I are actually making up to $400 when I sell one million coins on Ebay and also this is a significant return in my investment. FIFA 14 Ultimate Team cover stars are unveiled, New leagues are about to be added. I also discovered that with my newfound skills, I can earn more income by selling my gold coins for cash online with other players, which to me was an amazing discovery since I'm just a kid. Hello, this weekend is nice for me, because this time i am reading this great informative post here at my residence. Hello! I just want to offer you a big thumbs up for the excellent info you have got right here on this post. I will be returning to your site for more soon.